Kareem Abdul-Jabbar, renowned writer, cultural critic—and yes, basketball icon—has started a foundation that helps youngsters in Los Angeles get exposed to nature, science, and other STEM subjects. The idea is to foster their interest in STEM, which is where the future jobs are, Abdul-Jabbar says. That’s according to NPR, which reports that through Abdul-Jabbar’s Skyhook Foundation and Camp Skyhook, where L.A. youngsters can interact with nature and do experiments at the Clear Creek Outdoor Education Center, inner-city youngsters are exposed to a new world of possibility. As the mother of a son who obsessed over nature as a child and now studies computer science, I see the connection. 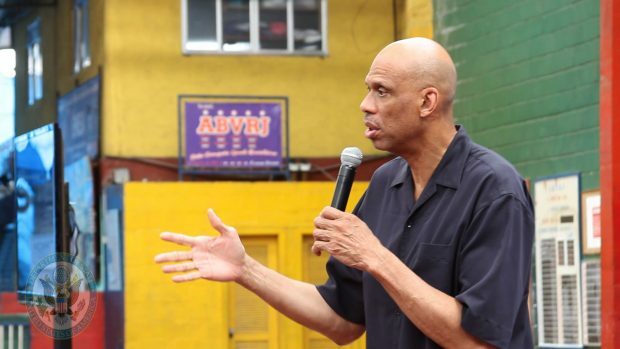 It’s heartening that Abdul-Jabbar wants to pave a way for other kids to make that connection too. Here’s an excerpt from the NPR article. Kareem Abdul Jabbar is taking his shot helping narrow the opportunity and equity gaps with his Skyhook Foundation and Camp Skyhook. The Los Angeles nonprofit helps public school students in the city access a free, fun, week-long STEM education camp experience in the Angeles National Forest. Every week throughout the year, in conjunction with the Los Angeles Unified School District, groups of 4th and 5th graders attend Camp Skyhook at the Clear Creek Outdoor Education Center, one of the oldest outdoor education centers in America. The hands-on science curriculum allows students to study nature up close: take water temperature in a stream; take soil or forest samples during a hike; study the local wildlife, or explore the stars. That’s alongside the traditional fare of hiking, swimming, and campfire songs. It’s so popular, there’s basically a five-year waiting list for the camp in the city’s schools, where about 80% of students receive free and reduced-price lunch. Having an NBA Hall of Famer and the league’s all-time leading scorer support the camp certainly helps attract attention and financial support. They do at Camp Skyhook. I reached out to Kareem Abdul-Jabbar by phone for details on the program and to find out what motivates him to advocate STEM Ed. You continue to have a really interesting, engaging, and productive life after your NBA career, including numerous books and more. Why did you decide to start the Skyhook Foundation and Camp Skyhook? I’ve always been an advocate of literacy and just giving kids tools that they can use to have productive lives. That’s so important. All the good jobs in the 21st century are going to be centered around science, technology, engineering and math. There’s no way around it. So if we can give kids an idea of where the jobs are and what they have to do to get those jobs, they can adjust right now. We try to get to them before they get pulled in various directions by peer pressure and popular culture. It’s so easy. So many of these kids, they want to be LeBron James or Beyoncé or Denzel Washington. They think that unless they’re a star they don’t have anything to offer. That’s not true. Previous Medical News Today: Could vitamin B-3 be the answer to miscarriages and birth defects?